I'm at the airport, waiting on a plane to go home. I did go back to the North Market this morning for more hot sauce. I got their web address. You can find CaJohns at www.cajohns.com . It looks like they make all of the hot sauces that they sell. I took a photo of this lovely lady yesterday. 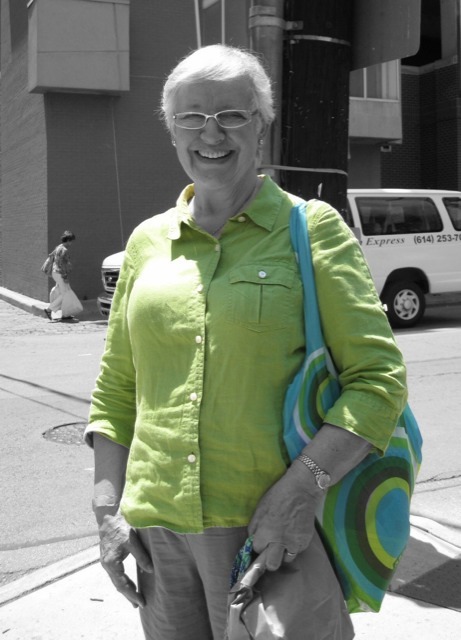 The green of her shirt with the blues in her bag caught my eye and she was nice enough to smile for the camera. I'm sorry to say that I forgot her name – but she saw this post and got in touch! Patricia Dignan is from NZ but has lived in Cincinnati since 1963. When we ran into each other she was with her daughter (who was also lovely, but not dressed in this great shade of green). I played with photo in an app called Colorsplash. It puts a photo into greyscale and then you 'paint' with your finger to bring back the color. This is way too much fun!